"Sometimes all we need is a great song, A prayerful song, An evergreen song. Allow me introduce DIMEJI to you. An afrobeat artiste whose music is a unique mix of trendy sound and exotic African beats. As an artiste, DIMEJI as honed his skill as a backup vocalist to a number of artistes with him featuring more recently on MVP's Ejo. To the "not so observing" eye, He is a blend of AdekunleGold and 9ice in the unique way he sings and infuses proverbs to tell a story of music and love. 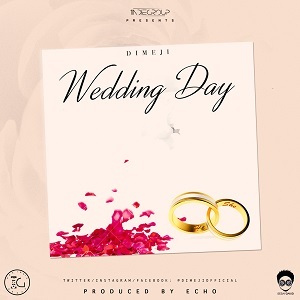 His debut single Wedding Day talks about how beautiful a wedding is, how important it is for couples to understand each and other crowning it all up with prayers that would last a lifetime. Delivered in English and Yoruba, this song is sure to be your No 1 Wedding day request song". Please let's know what you think and do share with your followers if it's deserving.